You can also enjoy customized to replace the wheel. 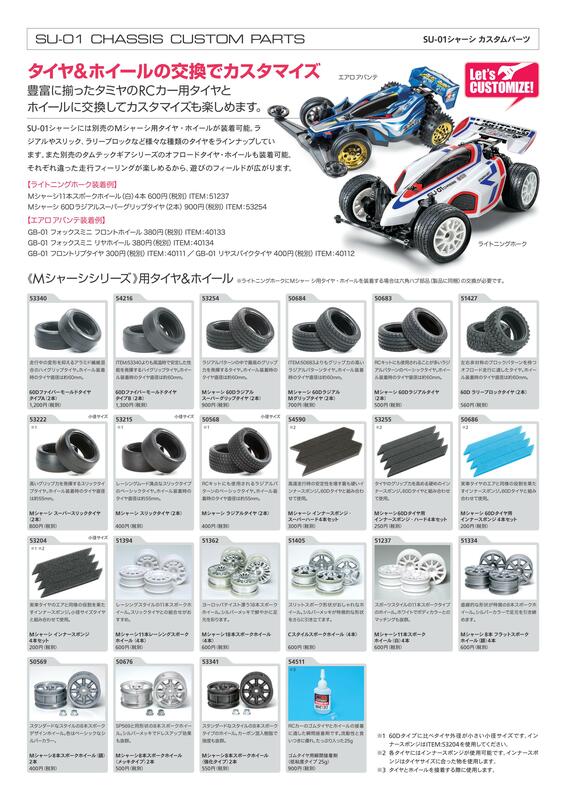 ※If you want to mount the tires and wheels for M chassis to Lightning Hawk is necessary to replace the hexagonal hub parts (included with the product). SU-01 is in the chassis can be installed is M tires and wheels for chassis sold separately. La Dialkyl and Slick, has a lineup of various types of tires. Also off-road tires and wheels of TamTech Gear series (sold separately) can be installed. Since traveling feeling differently each can enjoy, it spreads the field of play. Aramid fibers mixed to suppress deformation during running for high-grip tires. Wheel mounted Tire diameter of about 60mm of time. Stable at a high temperature at the time than the 53,340 High-grip tires to exhibit the ability. Wheel tire diameter of about 60mm at the time of mounting. The best grip in the radial pattern. Tire to exert force. Wheel mounted at the time of Tire diameter of about 60mm. High grip force than 50,683 Radial pattern tire. Wheel mounted Tire diameter of about 60mm of time. Raj also be used in RC kit often Basic tire of Al pattern. Wheel tire diameter of about 60mm at the time of mounting. With a block pattern of left-right asymmetry Tire suitable for off-road. Wheel Le tire diameter of about 60mm at the time of mounting. A role similar to that of the actual vehicle tire air plays to the inner sponge. Small diameter size tire used in combination with. Racing style of eleven Supokuho. Our combination of a slick tire recommended. 18-spoke drifting Europe taste wheel. Vividly foot silver plating. It adorned the original. Slit spoke shape stylish. Characteristic shape is silver-plated it further brings out. 11-spoke type of sports style wheel. With the body color in white matching also excellent. Slick Thailand to the high grip. Tire diameter at the time of the wheel mounting About 55mm is. Racing mood slick type Basic tire. Wheel mounted at the time of Tire diameter of about 55mm. 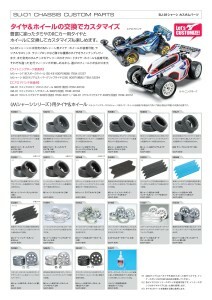 Rajiarupa which is also used in RC kit turn of basic tire. Tire diameter at the time of wearing is about 55mm. Hardest increase stability at high speeds Down donor sponge. 60D tire and the combination allowed. 8-spoke of the standard style Design wheel. The color is a basic sheet color. SP569 and eight Supokuhoi of the same shape. Dress-up effect in the silver plating also excellent. 8-spoke of the standard style Type of wheel. Carbon mixed resin. Strength also excellent. A role similar to that of the actual vehicle tire air plays to the inner sponge. 60D tires and set combined use. ※ 1 60D is a small-diameter size tire outer diameter is smaller than that of the type. Please use sponge item 53204. 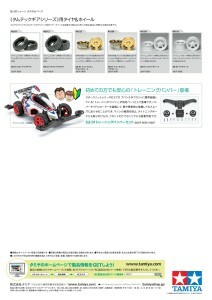 ※ 2 Inner sponge is available in each tire. Inner sports will use the ones that match the tire size. ※ 3 It will be used to adhere the tire and wheel. ※ If you want to mount the TamTech Gear series for tires and wheels to Aero Avante is a need to replace the hexagonal hub parts (included with the product). Same off the Lightning Hawk standard tire. As spare partsuse. Same Li and Lightning Hawk standard tire Spike tires for ya. As spare parts use. Design is reminiscent of yesteryear of the finest cars Fox for the gold-plated wheels. Lightning Hawk standard wheel and the same size. Design is reminiscent of yesteryear of the finest cars Fox rear for the gold-plated wheels. Lightning Hawk standard wheel and the same size. Also attached to the clock, it is also can be attached to the rear, not the front only. This entry was posted in Customized Builds, Future Releases on February 26, 2016 by admin.